Here is another exercise in seeing the pencil drawing first and then comparing it to the inked version of it. 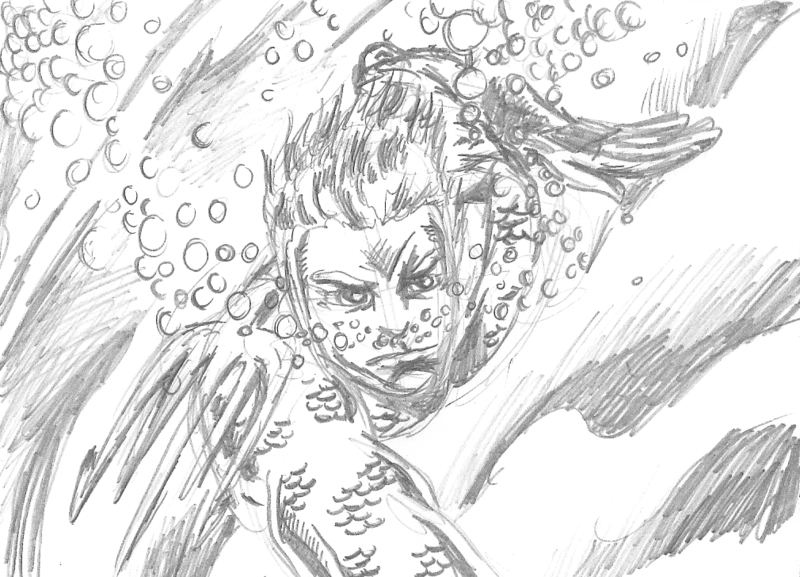 One of the biggest challenges when drawing Aquaman is the drawing him in water. Like, typically there would be a lot of lines drawn all over the place to simulate the waves inside of the ocean. That looks messy and ugly. The solution that I used when drawing this picture is to make the ocean have wavy blacks to simulate the underwater shadows. I briefly talked about this in the Dr. Octopus post, but the pencils give the watery shadows effect a more textured look because the pencils allow me to control the gradient of it. When inking, crosshatching is supposed to replace the gradient, but that is not always an attractive looks in something like water, which should be clean and fluid looking.